The Edmonton Oilers’ defensive corps could look very different between now and next October. Veteran defencemen Andrej Sekera and Kris Russell each have modified trade clauses that kick in next summer, and there’s a chance that both players could be moved before then. Matt Benning is a solid third pairing option, but it’s unclear whether or not he’s part of Edmonton’s long-term plans. 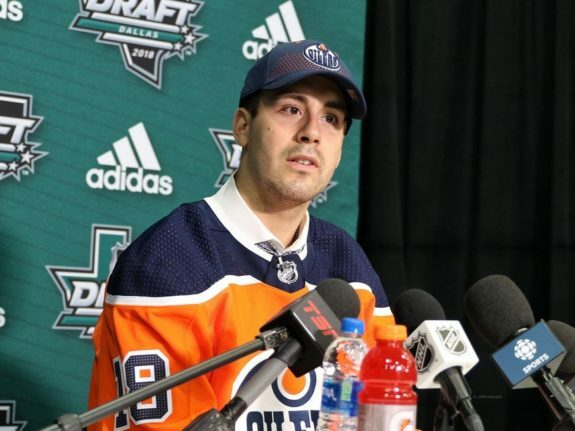 Top prospect Evan Bouchard will be in the Oilers’ opening-night lineup in 2019-20. During his seven-game audition with the big club this year, he displayed an uncanny poise with the puck in his own zone and is capable of crisp, tape-to-tape outlet passes that is impressive for a teenager at the highest level. Aside from Bouchard, the Oilers have several other promising young defensive prospects pushing for NHL work. The Oilers would probably prefer not to break in multiple rookie defenders in the same year, but if the kids are ready to take the next step, then the coaching staff will find spots for them. Here are the three most likely candidates to arrive in Edmonton in 2019-20. After putting up six goals and 18 points in 37 games as a rookie pro with the AHL’s Bakersfield Condors in 2017-18, Ethan Bear was recalled by the Oilers on Feb. 27. He had one goal and three assists in 18 games and quickly became a fan favourite in Oil Country. The 21-year-old Regina, Saskatchewan native showed some good offensive instincts and an excellent one-timer from the point during their stretch run for the playoffs. Bear almost made the Oilers out of camp this year, and even traveled to Europe with the team for the 2018 NHL Global Series Challenge, which illustrates how close he is to making the big club. Unfortunately, this season hasn’t gone as smoothly for the former fifth-round pick. Bear missed more than three weeks with an undisclosed injury and doesn’t have a goal in 16 games. There could be another opportunity for him to play some NHL games this season, but first, he has to find his offensive groove at the AHL level. I believe Bear has an NHL future, but because he and Bouchard are both right-shot puck movers his chances to make the team out of camp next year likely hinge on whether Bouchard is ready to play top-four minutes as a rookie. When you’re the son of a retired NBA player and the brother of an NHL star, expectations are higher than with most fourth-round picks. Following an inconsistent start to his pro career, Caleb Jones is starting to live up those lofty hopes. He has taken a leap forward in the scoring department this season, putting up two goals and 12 points in his first 21 games. 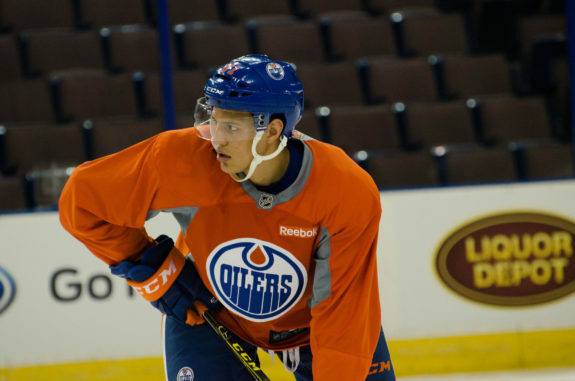 The 21-year-old Frisco, Texas native attributes part of his success to working closely with Oilers skills development coach Paul Coffey, who helped him build his confidence and shortened his stick for improved puck control. Jones might never be a big point producer at the NHL level, but he can lead an offensive rush with his tremendous skating ability and be a consistent physical presence in the defensive zone. With Oscar Klefbom out for the next few weeks at least, Jones was recalled by the Oilers on Wednesday. If Jones excels in a third pairing role, then maybe he’ll stay up in Edmonton permanently, but even if goes back to Bakersfield in January, Jones has a great opportunity to show head coach Ken Hitchcock he’s ready for full-time work in 2019-20. Just two year ago, Joel Persson wasn’t on the radar of a single NHL club. At the time, he was working as a teacher’s assistant at a middle school in his native Sweden while playing tier three pro hockey. But after earning a roster spot with the Vaxjo Lakers HC in 2017-18 and leading the Champions Hockey League in assists (10) and points (11) by a defenceman, Persson became a legitimate NHL prospect. The Oilers quickly inked Persson to a one-year, entry-level deal this past May but loaned him back to Vaxjo for this season. Related – Oilers & Persson: Where Does He Fit In? A late bloomer, Persson ranks second on Vaxjo in assists (12) and third in points (15) through 24 games this season and represented Sweden for the first time at the 2018-19 Euro Hockey Tour. He has excellent vision and owns a blistering slap shot, which could make him an option for the power play at the NHL level. 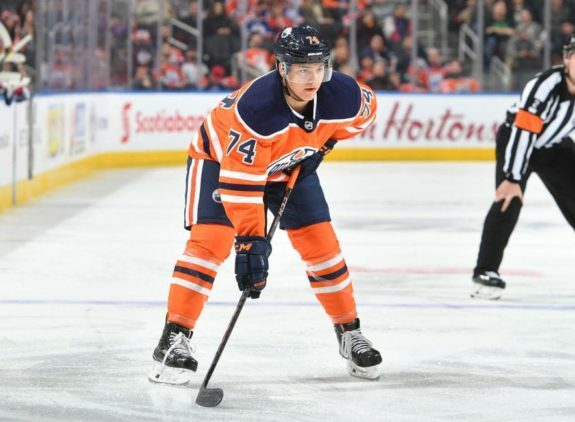 The 24-year-old Kristianstad, Sweden native is expected to play in North America in 2019-20 and could be in the mix for a roster spot with the Oilers. If Bouchard ends up being the only new addition to the top six next fall, I could see Persson having the inside track on a depth spot over the likes of Bear or Jones.